Meeting and Event Planners in Atlanta looking for team building activities have the perfect event venue and two of the most fun and unique group activities just minutes from downtown Atlanta at Stone Mountain Park. Adventures Up The Creek provides on-water team building fun with large group kayak tours and activities as well as outings and races using Georgia’s ONLY giant War Canoes. Adventures Up The Creek has offered the best in all-natural, organic team building and team bonding activities for over 21-years with a perfect safety and customer service record – making Adventures Up The Creek the go-to provider for outdoor team building fun. 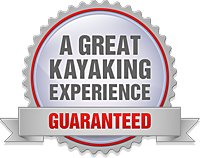 Getting your reservation started is as easy as emailing the dates and times you’d like to get your group on the water, and what type of activity you’re looking for, to info@KayakUTC.com. Kayaking with a large group (up to 22 people) is a fun and unique way to achieve team bonding or team building goals organically – without the contrived team building challenges that can make some people resistant to participating. 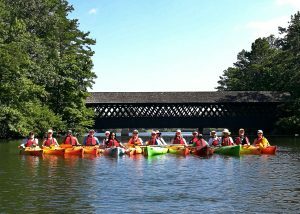 Adventures Up The Creek starts with instruction and goal-setting so that everyone is on the same page; then we assign kayaks and equipment and launch into Stone Mountain Lake for a tour of its most scenic views – including a trip under the Covered Bridge, up to the Grist Mill and over to the Carillon before heading back to the put-in. More competitive groups can take on one of our on-water team challenges (like a team race or on-water musical chairs), but even without added challenges, a large group kayak outing always achieves the desired benefits of any team building event – things like enhanced team work and communications, a shared experience out of everyone’s normal comfort zones and even some problem-solving and trust-building. 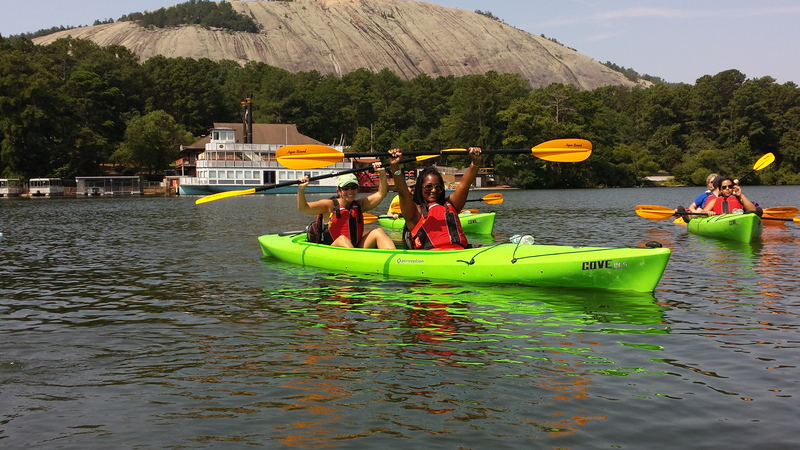 If you’re looking for something completely unique and totally fun for groups of up to 20- people, Adventures Up The Creek has just the ticket: Big Canoe Fun (http://www.BigCanoeFun.com) Using two 25-foot long, 10-person, Voyageur-style canoes, groups can simply tour scenic Stone Mountain lake as a team bonding activity – or more competitive groups may opt for a Big Canoe race. 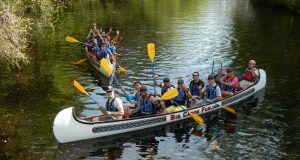 A Big Canoe outing, event or activity defines Organic Teambuilding – it happens naturally, as an integral part of the event and there really is no other option. From boarding the canoes, to paddling, maneuvering, racing and even docking them at the end and unloading, team work and cooperation is simply not optional when using the Big Canoes – it’s actually quite natural and easy and clearly illustrates the value and benefit of working together as a team to more easily achieve your goals. The Marriott Evergreen Conference Resort at Stone Mountain Lake hosts many of our events — offering a buffet-style or cooked-to-order lunch, meeting rooms and lodging for out-of-town quests. For a full-day event, contact the staff at The Evergreen and they’ll help you with meeting space, lunch and any other accommodations you may require. You’ll also want to contact the park for information on getting passes for each vehicle entering the park. Whether using kayaks or Big Canoes, Adventures Up The Creek guarantees your team or group event will be a tremendous success and leave lasting memories your team will talk about for years to come. 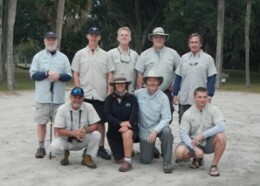 We work with several Atlanta area corporations – both in Atlanta and at our locations on the coast (Amelia Island and Jacksonville) — providing a complete break from the typical, indoor work environment with all-natural, adventure-based, outdoor group activities that everyone is sure to enjoy. When it’s time to get your team out of the office and into nature for fun, adventure and bonding, email us for your custom-designed Organic Team Building event. For more information or to start the process of booking your event, email Adventures Up The Creek at: info@KayakUTC.com.